We inspire people to live, work and serve to their purpose, passion and potential. Retire with Purpose encourages those 50 years and older to think about how they will thrive in retirement. We particularly want to influence deeper thinking and planning into service. Living, working and serving to our purpose, passion and potential is a continuing theme for the Life Solutions Network. What better time is there for this than retirement? It’s a time when we are unleashed from the demands of work. Research shows that people with purpose live longer and healthier. We believe that people with purpose find ways to serve. If you are 50 years of age or older, it’s time to start thinking about your future. It can be a daunting or exhilarating time. Plan it deliberately to craft your ideal life. 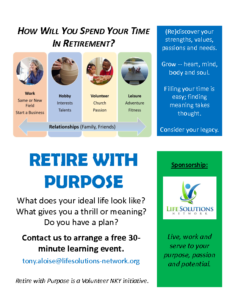 Retire with Purpose is a free 30-minute small group session. We come to your location at a time convenient to you. Money is important and so is your health but have you given sufficient thought as to how you’ll use your time? Have you ever thought about why you are here on earth or thought about your legacy? 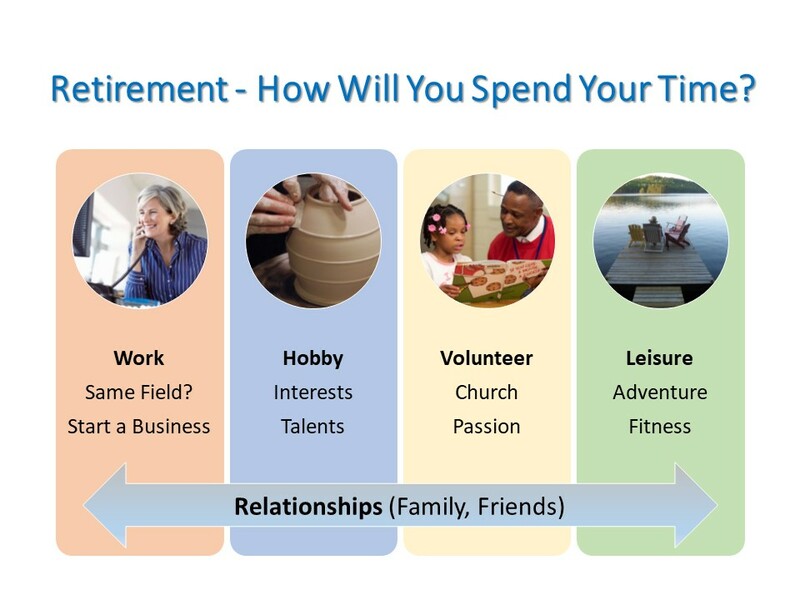 You will have a lot of time in retirement; it will get filled up. Why not use it purposefully? We spend more time planning our vacation than our vocation. Why not have a thoughtful and deliberate life plan? Open the file below to see our flyer. The Life Solutions Network encourages “purpose, passion, and potential” in the form of capability-building service to our community. Our collection of life skills content, presentations, blogs and Facebook postings is intended to inform and inspire. Copyright © 2019 Life Solutions Network, LLC, All rights reserved.